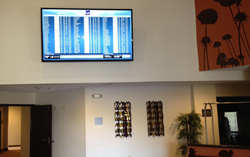 Flyte Systems announced the Sleep Inn DFW Airport North installed a FlyteBoard travel information display. The Sleep Inn recently completed a total renovation and implemented FlyteBoard to boost guest convenience and loyalty with comprehensive real-time DFW airline flight schedules. Click here to request information on Flyte Systems’ airport travel and guest information services. Flyte Systems is the leading provider of cost effective airport travel information displays and digital signage content for the hospitality, digital signage, and convention center industries and related businesses. Flyte is the only full service flight information display solution that provides subscription-based real-time flight departure information. The Sleep Inn DFW North is just a quarter mile from DFW and is perfect for busy travelers. The property offers hot breakfast each morning and free 24 hour shuttle services to DFW. Guests relax in the Sleep Inn DFW’s heated indoor pool and Jacuzzi. For greater comfort, all rooms have deluxe amenities,130 channels of HD entertainment and micro refrigerators. Flyte Systems offers a suite of products that serve the traveling public: FlyteBoard, FlytePass, FlyteChannel, FlyteTouch, FlytePad with handheld mobile airline information, and Flyte Systems’ Event Module. The company’s latest innovation is InfoBoard, which combines airline flight information with total property way-finding, weather, traffic, area attractions, and much more. FlyteBoard is a wall, floor, or ceiling mounted high-definition, flat panel screen for lobbies, restaurants, bars, and other public areas, displaying flight information for one or more airports. FlyteTouch enables individual guests to search flight information using an interactive touch screen that displays real-time flight arrivals and departures for one or more airports. FlytePass combines FlyteTouch with free, secure boarding pass printing. It is available as a standalone unit, or neatly packaged in either an all-wood kiosk or an integrated metal kiosk to match your décor. FlyteChannel permits guests to view live airport flight information conveniently and comfortably from their in-room television. FlytePad is a mobile-ready service that delivers real-time airline information via the iPad, enabling hotel staff to provide guests with airline information anywhere and anytime. Flyte’s Event Module displays user-controlled meetings and events on screens shared with flight information or on its own dedicated screen. InfoBoard is a cost effective touch screen display that saves labor, provides greater guest service, and generates revenue with flight information and so much more. Many hotels and resorts also use Flyte Systems’ applications to increase revenue with innovative marketing approaches for distressed travelers. For tips on how to generate revenue by providing guests with Flyte Systems airline information, please log on to the Flyte Systems website at http://www.flytesystems.com.